This chapter will emphasize that efficient integration of Information and Communication Technology (ICT) in disaster management process can help mitigation of impacts of disasters on people and the environment, minimizing the failures and maximizing the collaboration. 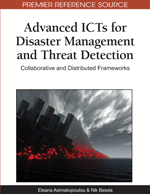 It summarizes the nature of information flow and management processes during disasters and the potential of recent ICT at three stages of disaster management. The requirements and problems faced during their deployment at different stages of disaster management process are stated. The solutions for common constraints are discussed as well as the critical factors that should be considered in efficient deployment of ICT in the disaster management process. Disaster management can be defined as the collaborative process and the set of actions of the relevant organizations/agencies and government to minimize and inhibit the crushing effects of disasters (Scalem, et. al., 2005; Rajabifard, et. al., 2004). This collaboration process involves the sharing of decision making as well as data and resources (Popp, et.al., 2004). Various bodies are involved in the process such as governments, disaster management organizations, responders, the construction sector and the general public. ICT plays an important role in management and mitigation of disasters by facilitating information flow as well as enhancing data collection and decision making in disaster planning, mitigation and management. ICT products include any product that can receive, disseminate, communicate, edit, recover, manipulate and store information electronically in a digital form. The deployment of advanced ICT at the pre-, during and post-disaster stages of disaster management enhances communication and collaboration. However, being prepared for a potential threat of a disaster does not mean to provide high technology information and communication tools at response stage of a disaster. The important point is to provide the appropriate technologies which are reliable, resilient and flexible to adapt to changes caused by the impacts of the extreme event. Use of sophisticated means of communication systems can cause failure in communication and collaboration.